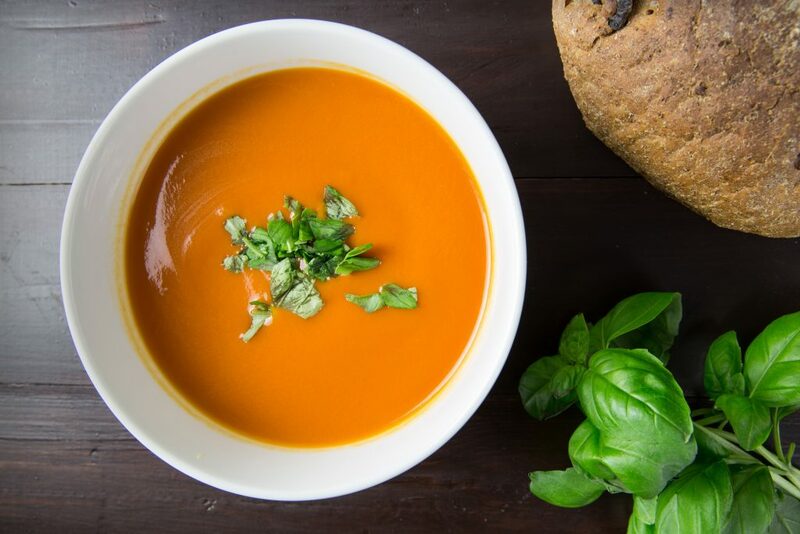 This red pepper & tomato soup is probably one of my favourite Thermomix soups. A long time ago, it was a TM31 demonstration staple and I still love it. It reminds me of the good old, university days (before Thermomix, obviously) when Heinz Tomato & Lentil Soup was a regular in the kitchen cupboard in my rental flat. The reason why this recipe is so good and showcased during the demonstration is for many reasons. Firstly, we’d grind the lentils to show the grinding ability of the lentils to a powder and also because they are ground, the cooking time is super speedy; perfect for a mid-week meal. In addition, the lentils add a little protein and thickening to the dish. The red pepper skins disappearing into the soup was always a wow factor at commercial demonstrations as any other kitchen appliance doesn’t blend the pepper skins so beautifully. With Thermomix it simply disappears. Do try this recipe, I’m sure you won’t be disappointed. It’s warming and wondering as a soup and if you have any leftovers it’s wonderful as a pasta bake too. Chop peppers, garlic and onion with the oil, 2 seconds, Speed 5. Saute 5 minutes, 120 degrees, Speed 1. Add stock, tomatoes, ground lentils and seasoning. Cook 14 minutes, Varoma temperature, Speed 2, MC on. Decant into a serving dish and wash the bowl. This ensures soup doesn’t cook/stick to the bottom of the bowl.